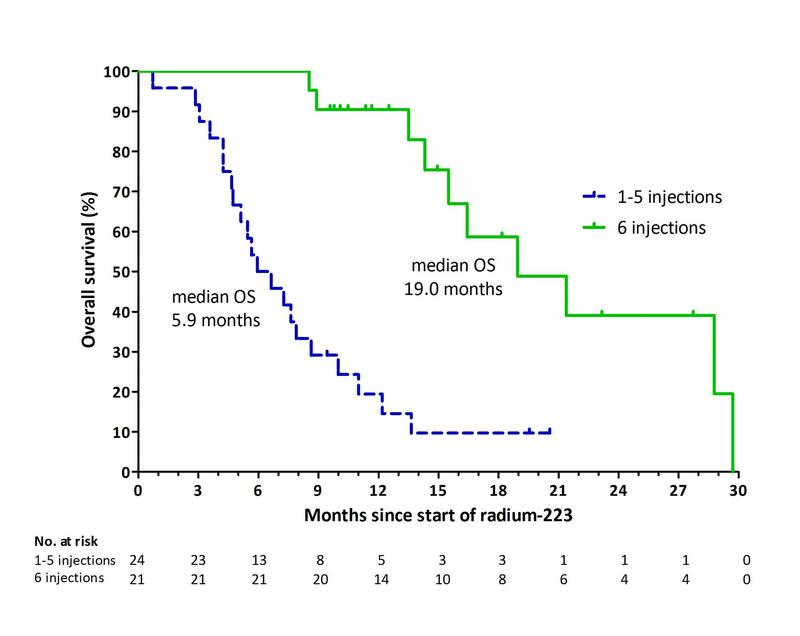 Radium-223 (Ra-223) is a registered treatment option for castration-resistant prostate cancer (CRPC) in patients with symptomatic bone metastases. 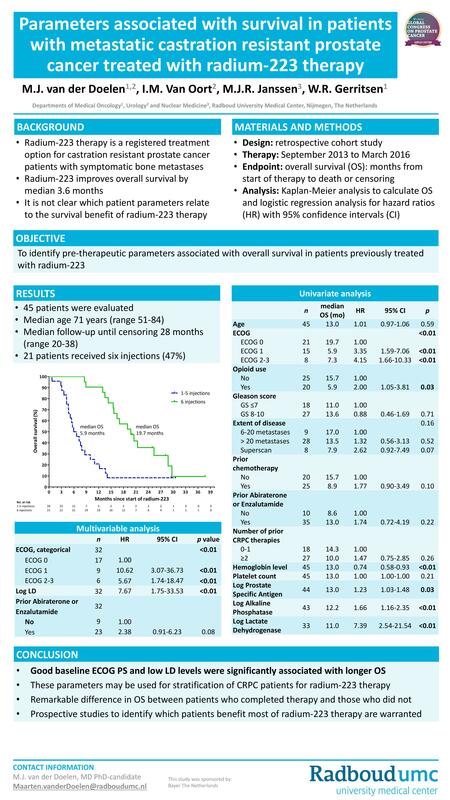 Ra-223 therapy improves overall survival (OS) by median 3.6 months.To date, it is not clear which patient parameters relate to the OS benefit of Ra-223. It is important to identify pre-therapeutic factors to estimate whether a patient will achieve the described OS benefit of Ra-223. Knowledge of these factors can lead to better patient selection. Therefore, the aim of this study was to identify pre-therapeutic parameters associated with OS in patients previously treated with Ra-223. We retrospectively evaluated CRPC patients treated with Ra-223 according to standard of care between September 2013 and October 2015. All patients who received at least one Ra-223 injection were included in the study. There were no exclusion criteria. We used Cox proportional hazard regression models to estimate hazard ratio’s (HR). A total of 45 CRPC patients who received at least one injections of Ra-223 therapy were analyzed. Median age was 71 years (range 51-84). The median follow-up was 12 months (range 9-27). Median number of prior lines of therapy was 2 (range 0-5). 25 patients (56%) received prior docetaxel chemotherapy and 35 patients (78%) received prior enzalutamide and/or abiraterone. 21 patients (47%) received six injections, 24 patients (53%) received 1-5 injections. 31 patients had died (69%) at time of analysis. Median OS since start of Ra-223 was 12.2 months (95% CI 7.7-16.6). Patients who completed therapy had a median OS of 19 months, versus 6 months in patients who received 1-5 injections (P < 0.001; figure 1). Univariate analysis showed that prior chemotherapy, baseline ECOG performance status (PS), baseline opioid use and baseline hemoglobin, ALP and LD levels were pre-therapeutic variables significantly associated with OS. Multivariable analysis demonstrated that baseline ECOG PS status (HR 5.6), opioid use (HR 3.6) and LD levels (HR 12.9) were significantly associated with OS. In this heavily pretreated cohort of CRPC patients treated with Ra-223, a significant survival difference was observed in patients who received six injections when compared to the patients who received less injections. Baseline ECOG PS status, opioid use and LD levels were significantly associated with OS. Prospective data evaluating patients treated with Ra-223 are warranted.